Our Birthright Plant Sales benefit the work of Birthright Victoria, offering caring support to women facing unplanned pregnancy. 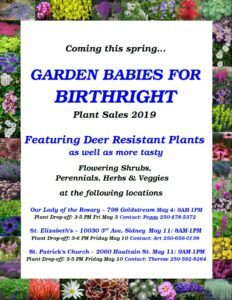 Ardent gardeners and Birthright Victoria supporters look forward to these sales all year round for their great selection of vigorous plants, knowledgeable help, and wonderful prices. Not to mention that your purchases help to support women struggling with unexpected pregnancy issues. That makes attending one of our Birthright Plant Sales a win/win opportunity! This year, we’re showcasing deer resistant plants at all three of our May Plant Sales. 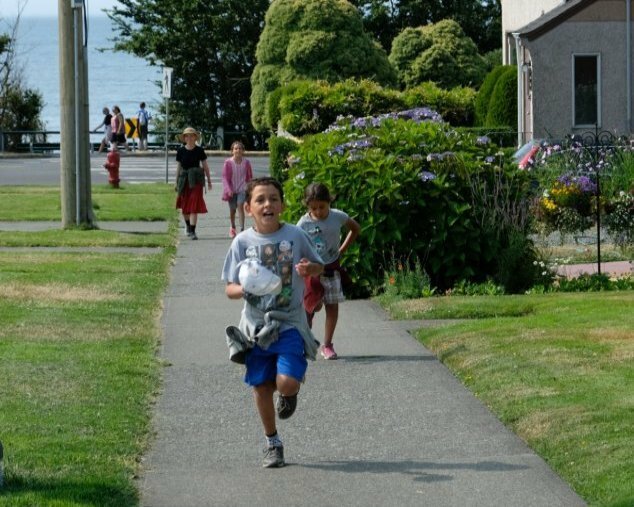 We’ll be in Langford on May 4 and in Sidney and Oak Bay on May 11. 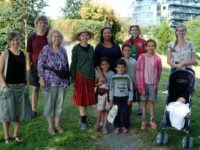 May 4 9 AM – 1 PM: Plant Sale at Our Lady of the Rosary 798 Goldstream, Langford. The first of our May Plant Sales! Keep an eye on our selection of flowering shrubs. They go fast! Browse our perennials, herbs, ground-covers, and veggies while you’re at it. And don’t forget to look over our wall of plant pictures to whet your appetite. You’ll also find a large list of deer resistant plants (our 2019 feature) plus lists for drought, shade loving, and shade tolerant plants. Plant donations gratefully accepted Friday, May 3, from 3 – 5 PM. May 11 8 AM – 1 PM: Plant Sale at St. Elizabeth’s Church 10030 3rd Ave, Sidney. In conjunction with the local Knights of Columbus Garage Sale. Each plant sale has a different flavour and somewhat different plants due to local plant donations. This plant sale always comes up winners with some unusual plant contributions! Expect the same picture boards and plant lists as at the Langford sale, weather permitting. This one’s an outside sale, so wild weather can make for hairy reading! A great selection of flowering shrubs, ground-covers, bulbs, herbs, and perennials! Plant donations gratefully accepted Friday, May 10, from 3 – 6 PM. May 11 9 AM – 1 PM: Plant Sale at St. Patrick’s Church 2060 Haultain Ave, Oak Bay. Flowering shrubs, ground covers, perennials, herbs, and veggies. Helpful volunteers to walk you through the plants and make suggestions to suit your gardening needs. Picture boards and lists for deer resistant plants, drought, shade lovers and shade tolerants. And great prices! This sale has everything you need for starting a new garden or filling out an established one. Plant donations gratefully accepted Friday, May 10, from 3 – 5 PM. 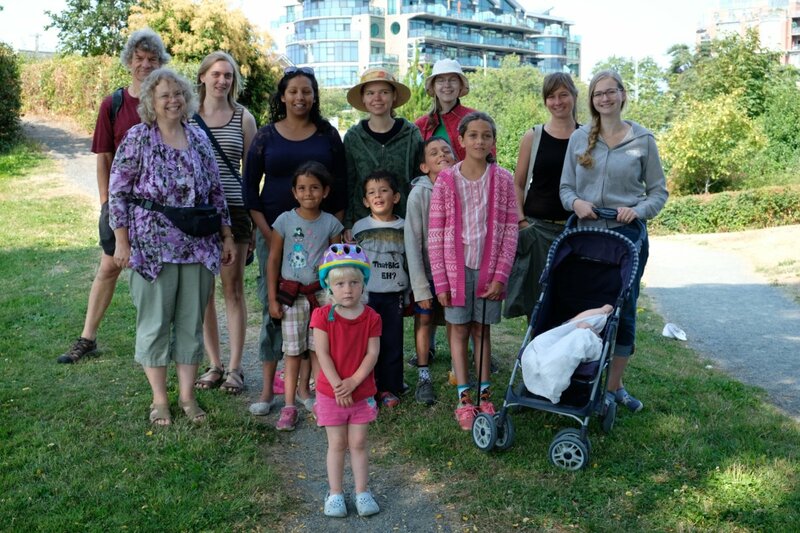 A BIG THANK YOU to all of our Birthright supporters in Victoria! We’re ending this year’s Birthright Fudge season with a bang: sold out fudge at our last sale at Holy Cross this past weekend, and a new, very high record for parish sales. For all who supported the pro-life mission of Birthright Victoria by packing fudge, selling fudge, or buying fudge, we greatly appreciate your support. The Birthright Fudge season is now officially over, but you’re not too late to get Fudge if you act quickly! I’m baking this week to fill one last order, so you also have one last chance to order Birthright fudge. Contact Peggy ASAP (see poster) if you want to order additional fudge. We’re hoping to set a new record for Fudge fund-raising this year! Once again, thank you to all of our Birthright supporters for another successful Birthright Fudge season! Birthright Victoria…because no woman should have to face an unplanned pregnancy alone! Birthright Fudge is Now Available! It’s November and that means another reason to celebrate: the arrival of Birthright Fudge in Victoria! Our volunteers will be selling home-made Fudge as well as Chocolate Apricots and Caramel Corn at area churches from now through the second week of December. 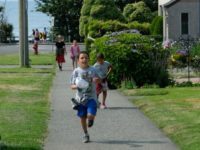 We’ll be at most of the Catholic Churches from Sooke to Cobble Hill. 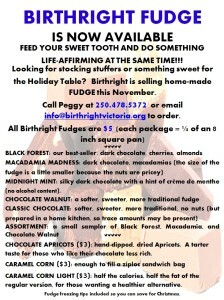 You can also order Birthright Fudge directly by phone (250.478.5372) or email. All of our Fudges are Chocolate and conveniently packaged to slip into a stocking or bring along as a hostess gift during your Christmas visiting. With names like Macadamia Madness, Black Forest, and Midnight Mint, how can you resist? Please scroll down to see more information about where our Birthright volunteers will be this Fudge-selling season. Birthright Victoria… serving women challenged by unplanned pregnancy…because no one should have to deal with a crisis pregnancy alone. 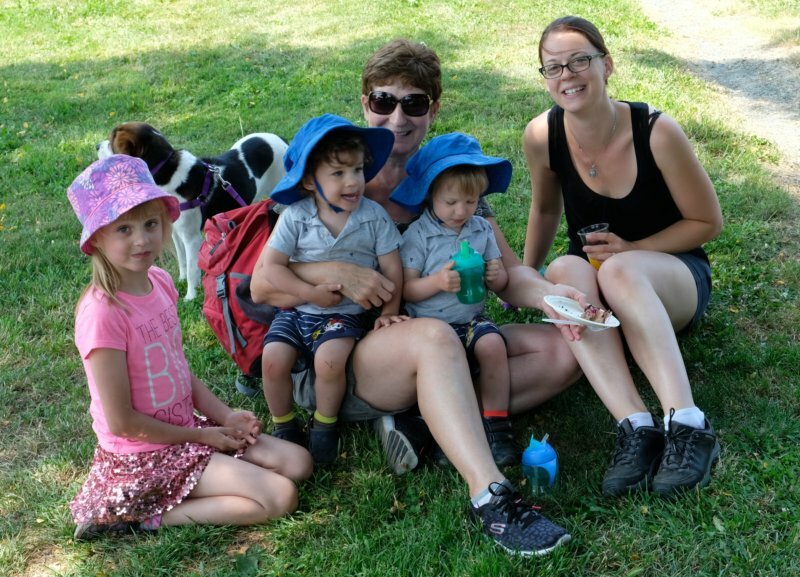 It was a challenging year for our Birthright Strollerthon 2018, with walkers experiencing illness, a death in the family, conflicting dates etc, but in the end the walk came together and we had another successful Birthright Strollerthon. Thank you to all of our walkers, both those who were able to participate this year and those who were not. Some pictures below from the Birthright Strollerthon 2018. Despite Victoria’s recent spell of hot weather, Saturday morning near the water dawned cool and breezy. 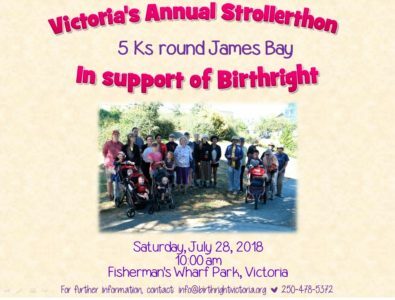 Just right for a stroll through James Bay in support of Birthright Victoria and our mission of support to women experiencing unplanned pregnancy. 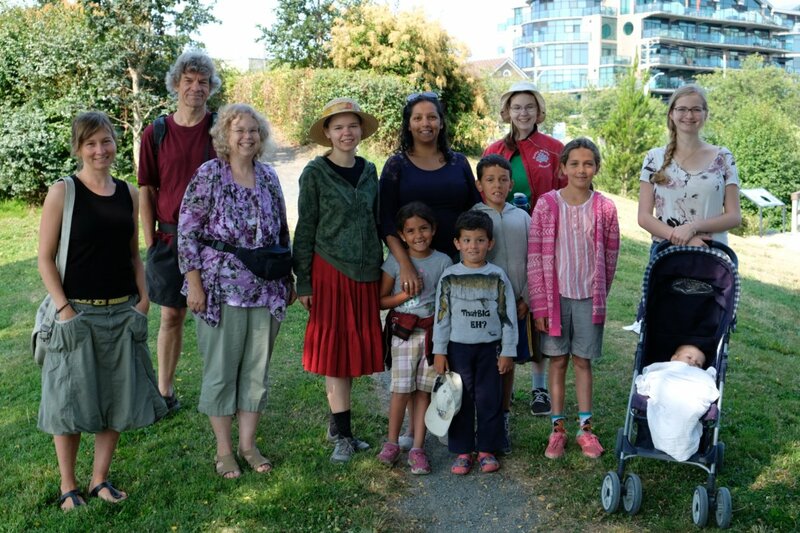 After the walk, we had an impromptu picnic complete with cake, juice, violin serenades, and visiting on the grassy slopes surrounding Fisherman’s Wharf Park. 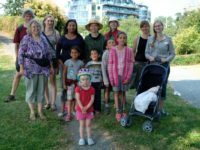 If you would like to donate to this year’s Strollerthon, it’s not too late. Please speak to our walkers or their representatives at the churches listed below.